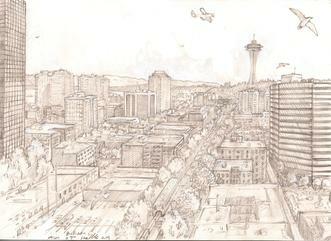 Above and below, View of the Brooklyn Bridge: three states of development, graphite on Fabriano paper, 22" x 30". A work in progress ( August and September, 2015), the above state showing several days notations on site. The image below shows the development in the studio from field notations and memory. I overworked it a bit knowing I'd reestablished highlights with an eraser. The third version is the last visit to the field. I'll complete this state from written notes on the drawing and side drawings of figures. The clouds will be a fun improv compared to the dilligent cable rendering. The water will be another partial improv balanced against the tonal development of the whole as it shakes out. Above: View from Jamaica Bay Wildlife Refuge, graphite on paper, 1993. Click on images to enlarge. 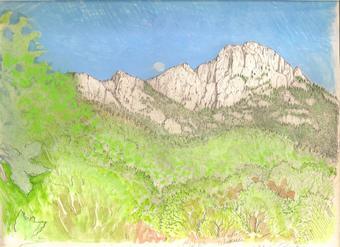 Above left, view from Ramsay canyon Arizona, 9" X 12", graphite on Bristol paper, 1994. Colored (inaccurately), afterwards from memory. 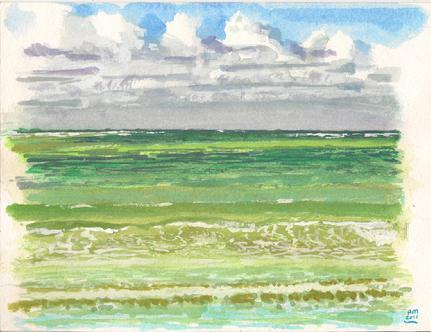 Above right, view of coast foothills from west Salem Oregon, 12" X 16" watercolor on linen, 2011. Above left: View from Fishing Rocks. Above Right: View of Yaquina Head, South Side. Both works watercolor/gouache on paper. To see the August 2012 Fishing Rocks and March-April 2013 Yaquina Head Sketching trips, click the link below. To see more Oregon sketches and watercolors, page one click here. 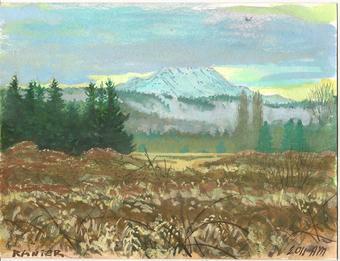 Above left and right: View of Mt Ranier, watercolor and gouache. Below Left, view of Seattle from hotel room. Left, view of Mt. 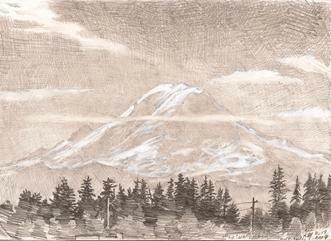 Ranier from Seatac airport. Drawings 8.5" x 11", graphite and gouache on bristol paper. The gouache was added later in the studio to punch up the highlights. Above left, view of the Atlantic from Rio del Mar Puerto Rico. Above right, the same view from the horizon down. The color of the ocean changed as a result of increased cloud cover. Below left another rendering from the same view point. Below right, a view of Honeymoon Beach, St. Johns USVI . 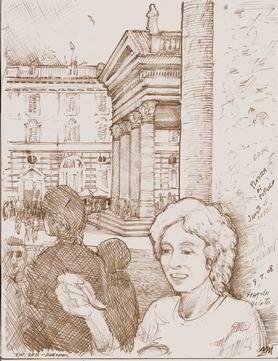 Above left, view of Piazza di Popolo from the twin churches with Janet enjoying gelato, 2008. On site the foundational position and gestures for the drawing are captured. Later with time, the texture, shading, and portrait can be refined. Right, I'm sketching from the Duomo Firenze. To see more drawings from Roma, Italia, and Other cities across the pond, Click here. 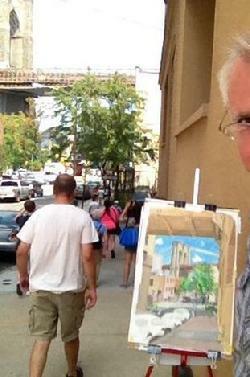 Below: Three sketches from New York city. 9" X 12', graphite on bristol paper. Some of these will become paintings. 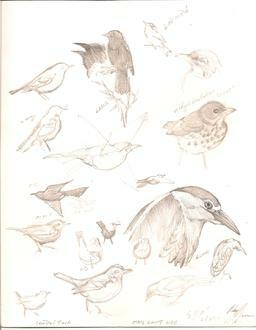 Above Left: Sketch Page for Wild Bird Fund Walk. 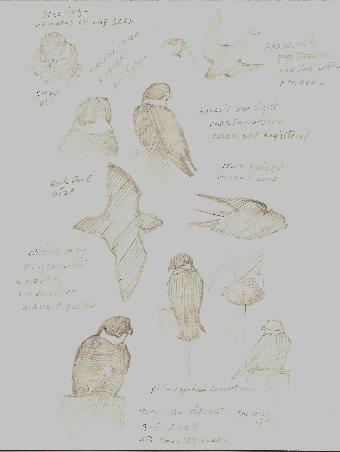 On the week preceding the birdwalks I lead, I'll make a sketch of the birds we might see for posting on their website. Above right: The Ramble, leaf litter and bird notations. Left, Wind fallen trees, Central Park, the Ravine. Drawn over three visits to the site, after a fierce August 09' storm. Right, misc. birds spring 09', Central Park. During migration I sketch birds recreationally. The paper gets smeared as they ride about in my shoulder bag for the weeks the drawings collect on the pages. Later I erase and cut in with gouache for highlights. Some of the cameos will show up in illustrations. 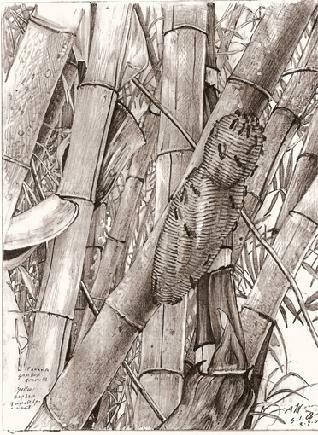 Wasp Nest in Yellow Bamboo Stand, Gamboa Panama. Graphite pencil and white gouache on bristol paper, 9" X 12", 2008. The main elements of this sketch were completed in the field, with segments rendered in detail. In the studio it was completed by following the segment cues, and "punched up", with eraser and gouache. Bat falcon, falco rufigularis, pencil sketch. While waiting at the dearture gate to flyout of Panama City airport, a strange shape zipped between the waiting planes after swallows hanging out on the gate collars. It looked like a cross between a bat a pidgeon and a falcon. In motion all I could get was general shape. It finally perched here and there and I caught some gesture drawings.